While we all know that smoking is a terrible habit – expensive, smelly and bad for your health – so too do we know that, in offices, the good gossip is found where the smokers are. You may like to think that you know all the office gossip – who thinks what, who fancies who, what projects are going well, who is hanging onto their job by a thread, but this is not likely unless you are one of those people shivering around a lighter, trying desperately to light their cigarette and smoke it before five minutes are up. Yes, you may know all the official stuff and possibly even some juicy stuff from your drinks on a Friday night, but the real day to day, who’s doing what gossip comes out over a fag. People who are unlikely to talk or even meet in the normal cause of their jobs can be best friends over a shared smoke and information that would never be discussed in a meeting becomes true currency when sneaky cigarettes and lost lighters come into play. You may not like it, but deny it at your peril. It is pretty unlikely that your office has a smoking room – these rooms used to be the place to have a cigarette in your coffee break. As a non-smoker, you could smell the acrid, heavy stench of smoke from about three corridors away, but this didn’t seem to stop the regulars calling in every couple of hours. If you do have a smoking room, you will be expected to use it for your cigarette breaks, rather than loiter outside the entrance to the building. Ideally, it will have good ventilation, but it is more likely to be dingy and dark, with an over flowing ashtray. It can be tempting to drag out (if you’ll pardon the pun) your break as you have a comfy seat rather than are huddles outside, but be careful not to annoy your colleagues. 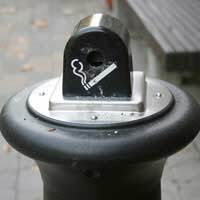 There may be an official or unofficial smoking area at your place of work. Companies know that people smoke, even if they don’t like it (this will probably depend on whether or not the boss smokes). This outdoor area may be a balcony, bench seating area or corner of the car park and this is where the gossip truly happens. So, how can you make sure that you don’t miss out on any important gossip whilst not succumbing to the evil weed? One key rule is not to go on about how awful smoking it. Everyone already knows that, especially the smokers themselves, so by playing the goody-goody there is no way you will get in on the juice. The best way is to join the smokers on their break but don’t smoke. Say you fancy a five minute break or just tag along. It may look weird at first, but persevere and you will soon be accepted. You could also make sure that you have a packet of cigarettes in your drawer, so the smokers (who never seem to have their own cigarettes but love to smoke someone else’s) will come to you first.